Let’s take a look at the month ahead, January, 2010, and see what the planetary influences are and how we can work with them. We’ll start with the most long-range and overarching influences, the planets Pluto, Neptune, and Uranus, which you will notice do not change from month to month but stay in the same sector of the sky for many years. Then we will look at the mid-range influences, Jupiter and Saturn, which stay in the same sign for 1 – 2.5 years. Last we’ll look at the personal planets, Mars, Venus, Mercury, and the Sun which stay in each sign for much shorter periods and primarily influence our day-to-day lives. We’ve spoken at length about Pluto in Capricorn (see category at right), where it will remain until 2024. In a nutshell, this long transit will bring fundamental change to many of the structures we have come to rely upon: government, the economy, industry, and transport systems, to name a few. The transit carries the energy of revolution and evolution and can be dramatic and at times overwhelming. Pluto exposes what is hidden, for better or for worse, and usually now, at the beginning of the cycle, we become more aware of the worse rather than the better. Pluto hastens and intensifies the processes of endings and new beginnings, and in Capricorn will bring about the ending of our business pursuits that are no longer suited to our growth and personal evolution. Whatever has been slowly leaking vitality will go ahead and die, including old business models, practices, and products. This is formidable energy, and your best strategy is to tune in and work with it. Find an area in your business life in need of renewal and begin the process before Pluto forces the issue. With Neptune in Aquarius (see category at right) from 1998 to 2011, we’ve been experiencing a global consensus regarding the equality of the common man, shared responsibility to the group, ascendancy of people and nations based on the power of knowledge, the right of all nations to progress technologically, and the right of each person to contribute to and further the base of common knowledge. The Uranus in Pisces (see category at right) transit from 2003 – May, 2010 has brought innovation and invention to business. It loosened all types of boundaries and enhanced global transactions and interactions. We have experienced many variables in play simultaneously, and have worked with moving parts which connected and disconnected frequently, including projects, alliances, and workforces. How can we continue to work with Uranus in Pisces? Product diversification, committee leadership, and collaboration, as well as global connection, and dissolution of hierarchical structures – any one of these is a good place to end the cycle. Saturn is in the sign of Libra, where it is exalted. When a planet is exalted in a sign, it has a special affinity to the sign and if you’re willing to do the work, there is a promised payoff. See the category to the right on this important transit, but in a nutshell: what is the work of Saturn in Libra? To develop patience, persistence, responsibility, and humility in relationships. What is the payoff? Cooperation and mutual support. 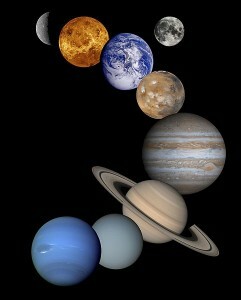 Until October 2010, Saturn is in square aspect to Pluto in Capricorn (see above). The stress of this square aspect will bring the end to structures that are no longer working in our business (and our world) as the Saturn energy attempts to install the Libra values of equity, parity, diplomacy, collaboration, and cooperation. Saturn makes its station and turns retrograde on January 14. Retrograde motion in the five outer planets is not felt as immediately as in the inner planets. You may notice outside regulators backtracking or bureaucratic snafus that affect your business. Or one of your trusted advisors may resign. Remember those business plans you wrote last quarter? Just proceed according to plan, and course correct if necessary. Jupiter conjuncts Neptune in Aquarius until mid-January. Jupiter, wisdom, and Neptune, inspiration, are very favorable when paired. Look for opportunities to expand your business involving technology, the internet, or humanitarian pursuits. On January 17 Jupiter passes from Aquarius to Pisces. Aquarius and Pisces have much in common in that they are both concerned with large groups and collective energies. However, Aquarius, an air sign, is hyper-rational and concerned with revolutionary ideas and the nature of one’s responsibility and contribution to the group. Pisces is a water sign, concerned with the emotional connections that bind people together. This often expresses itself as devotion to an ideal, often mystical or artistic, and the desire to lose oneself in the shared feeling of the group. Jupiter, the planet of opportunity and expansion, is the ancient ruler of Pisces. This will bring a very positive influence to all endeavors that attempt to unite people based on a shared intention for the future. How should you work with this energy? Work on connection. Set up links between people and organizations. Make venues available for your employees to express their ideas creatively. Be willing to lead with your intuition and feelings; show your employees, customers, and business associates your heart. Activities like these will bring good fortune. Mars is in retrograde motion until March 9. You may feel like you are retracing all the steps of progress you made since mid-October. Mars will bring a second chance to review your goals and rework your creative projects. Venus is in Capricorn until January 18. In Capricorn, Venus is concerned with material values. She is happy when we’re frugal with spending, practical in creativity, and reliable in relationship. When Venus enters Aquarius our social instincts rise; we become concerned with what is right and fair. We can improve our professional relationships by joining associations or contributing with others to a just cause. A group endeavor enhances our creativity. With Mercury in Capricorn all month, our minds have good concentrative power and you’ll find your memory improving. Watch out for a tendency to lose your sense of humor just when you need it most. Planning and strategy are all enhanced with this placement. Mercury is in retrograde motion until January 16. How can we best use this period? Backtrack, reconsider, repair, and reflect. This is a time to slow down and fix whatever is broken, whether unresolved issues from the past, personal misunderstandings, unfair trade negotiations, or glitches with phones, computers, or transportation. The Sun is in Capricorn until January 19, a great time for resolutions and planning. When it enters Aquarius, we can take our plans and begin to implement them. Endeavors involving groups and teams are particularly favored with the Sun in Aquarius. We begin the month with the Moon beginning to wane. The New Moon is on January 15, waxing to Full on January 30. Against the backdrop of massive global changes to the structures in our lives, we are inspired by and engaged with the global community as never before. With Saturn in Libra, we find our footing in committed, responsible relationships, and Jupiter enhances our emotional connection to one another. We want to forge ahead on our own plans but with so many planets in the collective signs, Aquarius and Pisces, we find our individual plans thwarted in favor of group endeavors. And with Mars retrograde and Mercury retrograde until mid-month, we may find ourselves reviewing and redoing rather than breaking new ground. This entry was posted on Wednesday, December 30th, 2009 and is filed under Astro4Business Month Ahead. You can follow any responses to this entry through RSS 2.0. You can leave a response, or trackback from your own site. Hi, Ellen! I had no idea you did astrology… and I’ve never seen it done with this particular bent… very helpful!! Soooo awesome to see this! Many, many thanks and Blessings to you in the New Year!! Love, Love, Love… E.